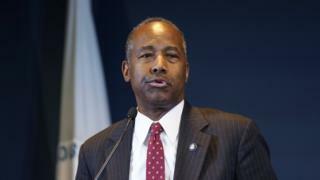 Image caption Ben Carson says Facebook is discriminating against people based on "who they are"
Facebook said it was "disappointed" by the charges. "We're surprised by HUD's decision, as we've been working with them to address their concerns and have taken significant steps to prevent ads discrimination," a Facebook spokesperson told the BBC in an email. Facebook "has offered advertisers hundreds of thousands of attributes from which to choose", allowing them to exclude groups like "women in the workforce", "foreigners" or "Puerto Rico Islanders", or those who expressed an interest in "Hijab Fashion", "parenting" or "service animal", the document says. On Wednesday, the company said it would ban "praise support and representation of white nationalism" on its platform after a man livestreamed an attack on two mosques in New Zealand.